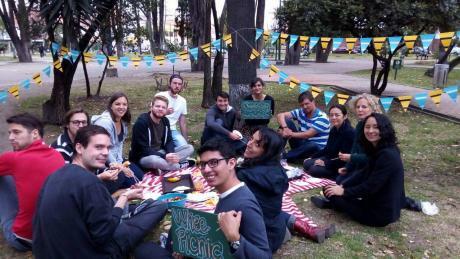 This article is written by Whee Institute ™ Team, as we are a mix of Colombians and Europeans, this article is intended to help foreigners that are planning to visit or start living in Colombia as well as those that want to learn Spanish in Colombia. Learn some Spanish:If you really want to get to know the Colombia, learning same Spanish is a must. It doesn’t mean that if you don’t have a good Spanish level you cannot travel or live in Colombia, we just recommend a little Spanish will go a long way. But don’t worry, basic Spanish is easy, an “HOLA”(Hello), “Gracias” (thanks) and a Big Smile will help you a lot. If you want to be more independent and discover more about Colombia, we recommend you take some time and Learn Spanish. 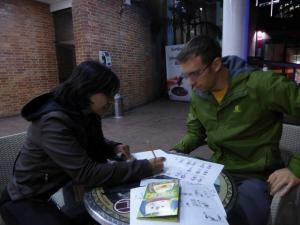 The great thing about people here is that they love it when foreigners trying to speak Spanish, and most of Colombians are willing to help you in any way they can. Make friends: Colombia is full of nice people willing to help, to teach you and learn from you. Everybody knows that in every place in the world you can find good and bad people, and like anywhere you can see which are which when you’re here. We encourage you to make friends with some lovely Colombians, this can help you a lot, not just to make your life easier but it will also improve how fast you Learn Spanish, experience the culture and discover new places. Location, Location, Location:This is advice that applies not only when you travel to Colombia, but to any country you want to go. Find a safe place to stay, and by that we don’t mean the most expensive, but do some research on the neighbourhood you want to stay in. Don’t worry it is not hard, in fact, most places are safe. Live cheap and have fun:Colombia is a really cheap place to visit and live in, and you can make it as cheap as you need. Try to see what Colombians do when they want to buy something (bargain). I met a girl that with the sentence “¿Cuánto menos?” (Not correct in Spanish) used to get a better price for everything, better than all the Colombians! Learn how to take public transportation because you can expend a considerable amount of money just taking taxis. Even if you don’t care about money, this will be fun for you! Learn how to help:when you come to Colombia you will probably find poor and homeless people in the streets, and yes, they need help. However, learning how to help is important. You have to learn who you can approach and who you can’t approach because it is related to your safety. You may be compelled to help by giving people money in the street but the reality is you can do more good by working for or supporting an NGO. There are many ways to help people, just try to find more information about it. Play safe:This sounds funny, but it’s important. Colombia is a really safe place if you take precautions. Avoid trying to show how much money you have while in the street. If you decide to volunteer in under privileged area, take a moment to think about what you wear and what you bring with you, cameras, phones, etc…. These are some simple tips that will make this country a really safe place for you and your family. Get a Colombian ID:Getting your “Cédula de Extranjería” will allow you to apply for a bank account, health insurance and will make your life easier in the country. Try not to compare Colombia to your country:Colombia is a great place, but you have to give it the opportunity to show you just how good. If you concentrate on the bad things of any place you are visiting you are not going to have a good time. Take time to see the many good things this country has, and then you will have a wonderful time here. Bring things you cannot live without:Colombia is globalized country, or at least we are getting there, but may be missing one or 2 of your home comforts. So, if there are specific foods, clothes, etc, you cannot live without we recommend you search to see if they are available here. If not, maybe learn how to make them or bring them here with you. Don’t take drugs:Colombia is famous for the drugs that are produced here, but those drugs finance wars in our country. Every time you buy drugs from Colombia you are financing Colombians death and forced displacement. Find more information on internet! We are not a traditional School. We are looking every day for new and interesting ways to teach our language, giving purpose to your learning and expanding the capability of your brain to absorb information in a fun and collaborative environment.